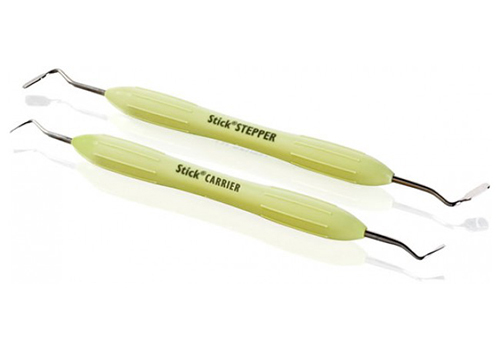 The StickCARRIER instrument is specially designed to facilitate the use of Stick and everStick® fibre products. The StickCARRIER is very useful during the positioning of the fibre bundle and functions at the same time as a tool to press the fibre bundle in place. The StickSTEPPER instrument is specially designed to facilitate the use of Stick and everStick® fibre products. The shape of StickSTEPPER instrument is facilitating the positioning of the fibre bundles while also protecting the remaining fibre bundles from premature curing during the placement procedure.